Lion First Facilities Management Services LLC was established in the year 2010 as a young, progressive and energetic company through the pa tronage of its parent company the Lion Holding Group with the aim of providing the same quality of service appreciated by its customers to the Middle Eastern region, keeping Dubai as a hub providing integrated facilities management services. Building on our established reputation in Europe as an industry­leading con struction and facilities management service provider, we are offering tailor­made management solutions for commercial and residential properties of all types to include: Construction, building assets and property management companies. With over 15 years of successful service delivery in the Europe and Eastern-European markets, we lead the way in providing solutions for specific activities that covers the most distressed areas, with hands on management experts who are involved in creating the perfect combinations to fulfil all your various needs. The progress of a company is measured by the success of its employees and how well they know and perform their duties and responsibilities. We understand the value of creating global standards and keeping up to those benchmarks as we expand regionally by having well-trained employees who are exposed to our periodical corporate training programs provided locally and in our headquarters overseas. 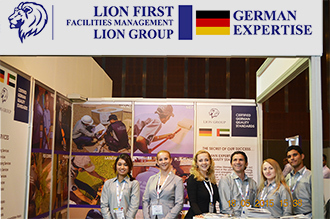 Lion First Facility Management Group were pleased to participate for the first time for the 4th consecutive year at Dubai Facilities Management Expo.